Salmon Jerky to the rescue! Hands down, this Salmon Jerky steels the spotlight from the all famous beef jerky. Since salmon is honestly my favorite food, I like to think of all sorts of ways to prepare it! Salmon Jerky is a hard one to resist. It is portable GAPS/SCD/paleo food! What more could you ask for? Salmon bellies (the small oily fin on the salmon fillet) are my favorite part of the salmon. I love them becsue they are buttery and crisp..mmmm. It literally makes my mouth water just thinking about these little bellies. (I buy them from my local fisherman). I wanted a unique way to take regular salmon and make it crunchy, like the bellies. I brainstormed, though it didn’t take long to be suddenly inspired to make Salmon Jerky! This Salmon Jerky reminds me slightly of the salmon bellies. They are not super oily, but the crispiness is half the fun! Oh one last thing…make sure you salmon is WILD!! This is a must, or else you might as well not even eat that antibiotic pumped, pink dyed, stuffy salmon. Ewww! Do your body and environment a favor and buy the wild stuff. It might be more expensive, but that is because the farmed salmon is ridiculously cheap. July/August is the best time to pick up a nice big fillet of wild salmon and either eat it, freeze it, or jerky-it. Yes you read that right. In my opinion Salmon Jerky is better then fruit, crispy nuts, veggies, butter…in my books it is a top priority food. Now don’t get me wrong, all of those options are good, but wild salmon keeps a special place in my heart..and stomach! It contains no sugar, no dairy, no wheat, no soy, no gluten, no preservatives. Salmon jerky can accommodate most all diets including the GAPS/paleo/SCD/anti-candida/low carb/ traditional food. It is pretty much a universal healthy snack. You are getting the purest real deal right here! This is definitely not the kind of stuff you get out of the bag, coated in nasty MSG and loads of salt. You will feel good and energized after eating Salmon Jerky. It is a pure good protein source, with just enough fat to keep you satisfied. Salmon Jerky doesn’t just have to be eaten plain. Feel free to get creative. The texture reminds me of crumbled bacon, so it would make a great flip flop for bacon, crumbled on a salad! Use can also use it to dip into salsa, guacamole, sour cream..etc… Crumble the salmon jerky and put into quiche or egg muffins. They would also be great mixed into a savory salmon dip! Let your salmon imagination swim WILD! Be sure to use fresh quality salmon, You can either buy it frozen or fresh. (If you buy it frozen make sure it does not contain preservatives in it.) It is helpful to freeze the salmon fillet for 30 min before you slice it, to get nice even cuts. Make sure to use real sea salt too! A sharp knife (i use this one) is a must, to cut the pieces of salmon away from the skin nicely. Make sure to buy a middle piece to get nice even thickness throughout the fish. Ok, I think that is all I need to tel you… I will stop blabbing, so you can learn how to make this AMAZING salmon Jerky! It also helps to have a dehydrator, because it turns out perfect each time! This is the dehydrator we have. 2. Use a sharp knife to cut ¼ inch pieces of salmon flesh. Once I cut through to the skin, I scrape the knife against the skin, to “peel” the salmon flesh away from the skin. Do this until all the salmon flesh is removed from the skin. 3. In a glass bowl or container, mix all your brine ingredients together. 4. Add the salmon pieces into the bowl of brine and let sit for 12 hours in the fridge, covered. 5. Remove from fridge and lay out bleach free paper towels on your counter. (I use 2-3 on top of each other). Carefully take the brined salmon pieces out of the brine and lay onto the paper towels to soak up any dripping liquid. * The lemon juice and apple cider vinegar almost “cook” the salmon so it turnes into a harder texture, be careful with it because it is more brittle like this. 7. Dehydrate for 3-4 hours at 145 degrees Fahrenheit. You know when it is done when it turns a darker reddish brown. It should be dry and chewy, not crunchy! When you bend it, it should not snap in half. 8. 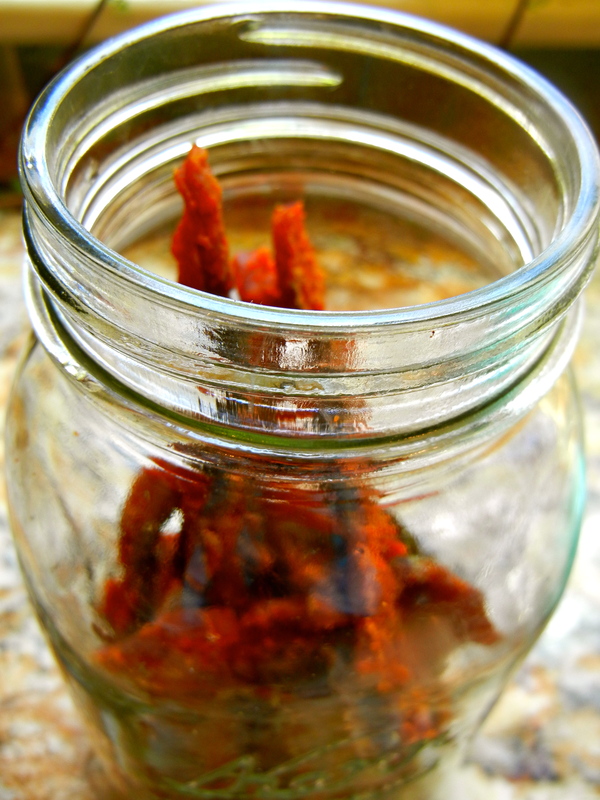 Store salmon jerky in a ball jar for many months. Enjoy the health benefits of salmon anywhere, even when it is not in season! Yum yum! Enjoy this Super power tasty food! Rub or Spray your oven racks with cooking spray (I recommend lard or coconut oil). Place salmon pieces directly over the racks. I’ve been waiting for this recipe! It looks beautiful, and it is such a clever idea. I’m going to give it a try without the coconut aminos, since I’ve heard that the jury is still out whether the aminos are legal on the SCD diet. Lauren I am sure it will still work with out them 🙂 They will taste amazing either way! I have totally been waiting for this, too! Thanks so much!! Sorry for the wait Hadass! I hope you enjoy them! What are your thoughts on smoked salmon is an electric smoker? Does it still have all the same health benefits?? hmm. i have never used an electric smoker. I think smoking fish and meat was done in the old times, so I think it would be like dehydrating! Just make sure you don’t put in the smoke seasoning because i don’t know what that has in it. Have fun smoking the salmon, i am sure it will taste wonderful! I just made some smoked salmon this past week and used the hickory chips for the smoke flavor which “smoke” in the bottom on the hot plate. For my brine I actually just cut up my salmon and put sea salt with some rapadura and let it sit for a few hours and then smoked it for about 14-16 hours. It tastes super yummy!!! Love all the detail on this Caroline! Thanks so much for sharing it with us at Scratch Cookin’ Tuesday! Does this salmon jerky need to be refrigerated? I just made some and it looks delicious. Thanks for linking this up! I never thought of making salmon jerky. Whole Foods is having a sale locally on salmon tomorrow. Better stock up! That is what I am doing tomorrow! I wonder if you could make this with another oily fish like trout? I heard fish that are higher in fat, like salmon, and because of that trout don’t jerk well (but my source is questionable). Any experience with other fish jerkys? ok wow that looks downright incredible! got. to. try. this! This jerky looks incredible! Never have tried salmon jerky but have certainly tempted me to change that! I LOVE this salmon jerky, my new favorite snack! We make beef and pork jerky all of the time around here. I can’t seem to keep it around for long. But, I have never heard of salmon jerky and will definitely have to try this. I’m sure my husband and son will go crazy over this! Thank you for sharing!! O My I love salmon skin! right up there with liver as my fav food! haha thanks a little touch up on the photo makes the color pop! I can not have any form of vinegar, do you have any suggestions on how to omit it? Hey Caroline! This is Sue from the 411. I’ve been looking for a good salmon jerky recipe and was so glad to see yours! Looking forward to making it soon – got a big fish order coming in from Alaska! How fun!! That is going to be some special jerky! What about frozen salmon I have some from Safeway? I just bought a food dehydrator and was researching on recipes. I’m so excited I will now be able to create my own snacks without the chemicals and junk companies add into their products. I love to be able to control what goes in what I’m cooking. I was a bit weary on doing jerky because I don’t want to cause anyone to be sick if I make it. So this is safe to do with fish? I will try it. dehydrating it cooks the fish. I will consider trying this salmon jerky recipe. I just bought a dehydrator Nesco yesterday. Thinking about using Salmon jerky during a 5-day hike through Death Valley. Most other sites recommend vacuum sealing, refrigerating, or freezing Salmon Jerky, but we will be camping, so no fridge. Should I ditch this idea as a food source for this trip?